Acts 26:1-32 This Easter we will have a dramatic presentation of the Apostle Paul’s testimony of the risen Christ before the Roman Procurator Festus and King Agrippa. This is Paul’s fifth and most elaborate defense speech. It is a masterpiece of rhetoric, designed to not only acquit him of the false charges against him, but also to present the living Christ before his hearers in a rational, yet persuasive way. At the conclusion even Agrippa is unable to refute his claims and responds, “In a short time would you persuade me to be a Christian?” To which Paul responds, “Whether short or long, I would to God that not only you but also all who hear me this day might become such as I am—except for these chains.” Now that we have heard, we too can no longer remain neutral. How will you respond to his testimony? Christ is risen! He is risen indeed! Acts 16:16-25 After a surprisingly great beginning for the gospel in a predominantly pagan city with the conversion of Lydia and her household, evil strikes back with force. Paul and his friends are confronted first by strange spiritual forces, then attacked by businessmen enraged by greed, and finally religious and political prejudices add fuel to the fire, creating a riot that lands Paul and Silas in prison. What do we do when evil is allowed to play every card in its hand with impunity? Is God still in control? Acts 16:6-15 In our text this Sunday, Paul, Silas and Timothy launch out into new territory to advance the gospel, but with no real sense of direction. Whichever way they turn the road is blocked for more than 200 miles. Given that Paul had a clear and proven strategy plus an exceptional team, it seems strange that the only divine direction they get is negative. They seem caught in a liminal space, the space in-between the “tried and true” and a new beginning. It is an uncomfortable place to be with no clear direction, but from a Biblical perspective these times are essential for our spiritual formation. If we embrace them, they deepen and matures us in ways our that our fervent activities cannot and lead us to new thresholds of opportunity. Acts 15:36-16:5 In Psalm 133 the psalmist joyously proclaims, “Behold, how good and pleasant it is when brothers dwell together as one!” This was Jesus’ overriding prayer for his disciples – “that they may be one even as we are one… so that the world may know that you sent me” (John 17:21-23). When the Holy Spirit was unleashed on the day of Pentecost the dream came true – the disciples shared all of life “together” with one mind and heart. Then suddenly a rupture occurs at the highest level of leadership. Emotions get heated, tempers rise and a fissure erupts with leaders parting ways. What drives leaders to disagree? How should it be handled? What does God do when things are not resolved amicably. 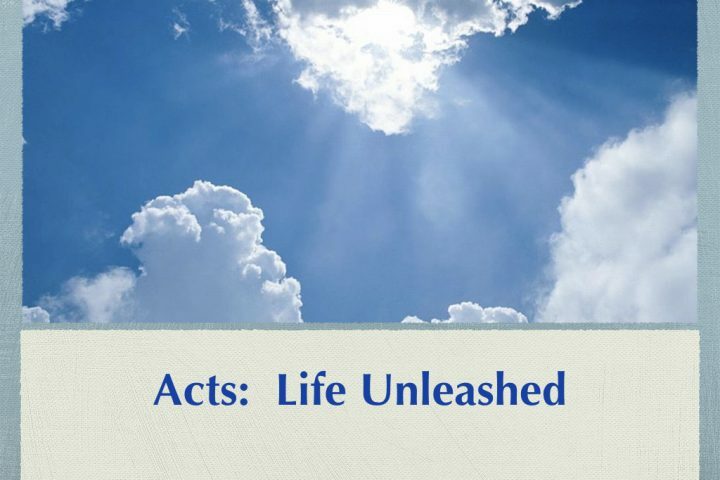 Acts 15:1-29 The Apostolic Council in Acts 15 is the watershed moment in the book of Acts. Luke demonstrates how the church has finally caught up with God’s initiative and formally declares that God has fulfilled his covenant with Israel and that the door is now thrown wide open to all without distinction to be part of God’s family. The implication is that we must never make ethnic or national distinctions a barrier to welcoming all races and nationalities into the kingdom. It is an on going battle, but as a church we are called, like Paul, to preserve the freedom of all, even when it is costly. “For freedom Christ has set us free; stand firm therefore, and do not submit again to a yoke of slavery” (Gal 5:1). Acts 14:20-28 On their first missionary, Paul and Barnabas have endured more violent resistance than one can imagine-slander, ridicule, death threats and stoning. After their final stop in Derbe, one would think they would choose the shortest and safest route home. To our surprise, they head straight back into the fire and retrace their steps all the way home. For the fledgling groups of disciples must be strengthened and the foundations of their faith fortified, if they have any chance of surviving the onslaught of persecution they will experience in the apostles’ absence. How strong are your fortifications? Could you withstand such an attack on your faith? How do we remain strong and strengthen each other’s faith? Acts 14:8-28 Commenting on our text for this week, Luke Timothy Johnson observes, “The growing resistance to Paul’s messianic preaching by Diaspora Jews reaches a savage pitch in Lystra.” After jealous rage and ridicule in Antioch and death threats in Iconium, Paul is now stoned and left for dead in Lystra. However, as God would have it, Paul’s life is anything but finished. He simply gets up, goes back into the city and the following day Paul and Barnabas set out for their final destination, Derbe, where they make many disciples unhindered. What Luke demonstrates is that the more violent Jewish resistance becomes, the more receptive is the Gentiles’ acceptance of the gospel. What a mystery! Given the violent resistance they’ve encountered, one would think they would choose the shortest and safest route home. To our surprise, they head straight back into the fire and retrace their steps all the way home. What are they thinking?